In 1916, Jan Wils won the design competition for a Dutch Reformed Church building in Elshout (now Kinderdijk), in which all architects belonging to that denomination could take part. It was another eight years before the building was on site. It is a simple aisleless church, lit by three high windows on each side. 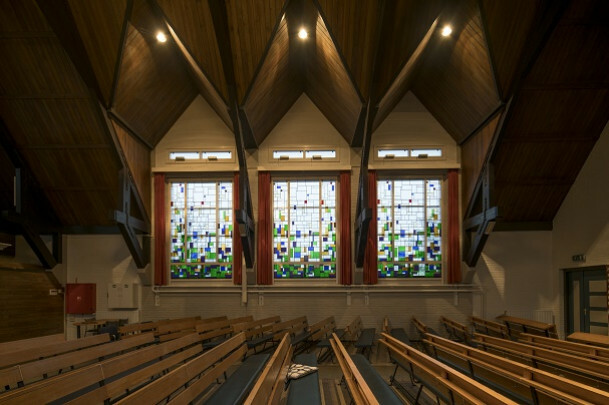 The leaded windows are in the manner of De Stijl, although it is not known who designed them. Theo van Doesburg has been suggested but this seems unlikely. A tall bell tower marks the whereabouts of the church at the bend in the dyke. The interior adds black, green, red and brown to the yellow and red of the brick. Wils also designed the pews.